If I had to pick one lipstick that I had to pick as my favorite, mostly because I can wear it for any occasion and with any colour, the choice would be this one - L'Oreal Color Riche - Aishwarya's Beige. The colour is a very neutral pink-based brown and is the best option for me when I want to go for an almost-no-lipstick look, and I am quite sure, it would look just as natural on most people. Just like the other Color Riche lipsticks I have tried, this one too is nondrying and stays about 3-4 hours. I have never tried longlasting lipsticks, and this is how much time most regular lipsticks last on me, so for me this is quite normal. These lipsticks have a faint smell, which I don't know what to describe as, but it is not an unpleasant smell, and I haven't had a problem with it. 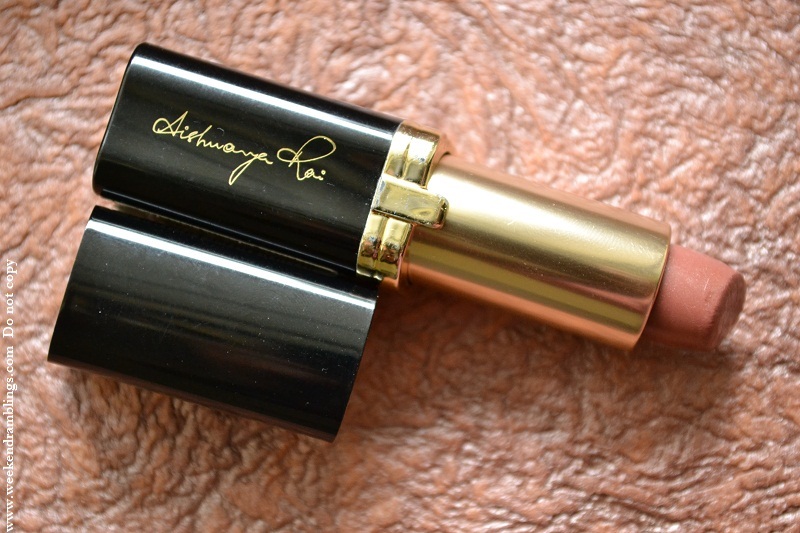 On the case of the lipstick, you will find engraved the signature of the star it's named after. 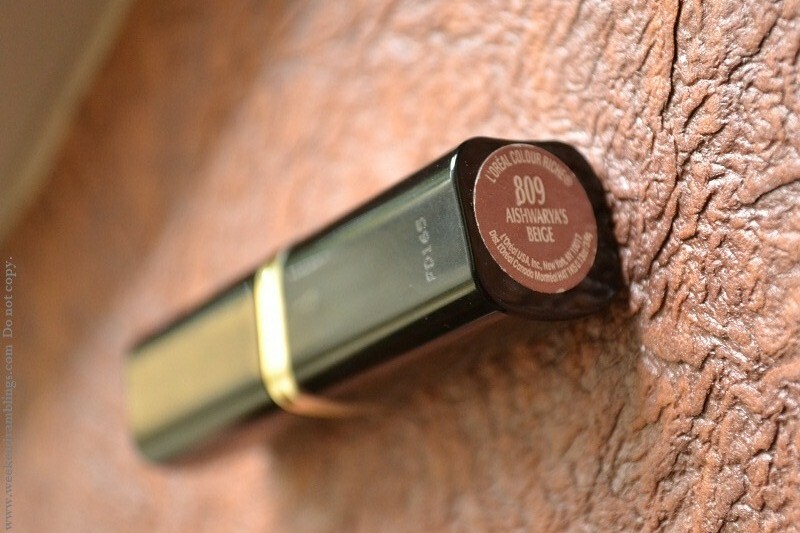 In India (and elsewhere too), I have noticed two varieties of this lipstick - one is what I have shown in the picture - a glossy pink-brown/beige with no shimmer. 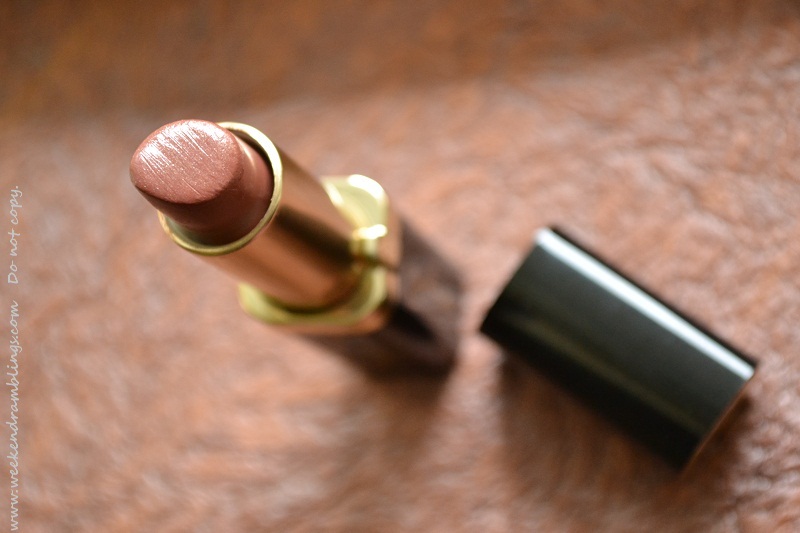 Another variety that I have seen more commonly is a light brown lipstick with a lot of shimmer/frost in it. 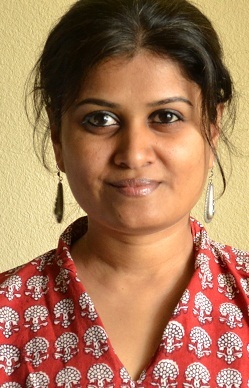 The two have different numbers, though both are named Aishwarya's Beige. I am not sure about the accuracy, but I remember reading a while back that L'Oreal had released a special edition of Aishwarya's Beige for her marriage, and the shade I have is I think that one. In India, this particular shade also has an extra embellisment of engraved flowers apart from Aishwarya's signature on the case. Between the two, I would any day pick this one rather than the apparently more popular shimmery brown version. I found it quite difficult to get a swatch of this lipstick, so here's how it looks on me :P A perfect lipstick to pair with darker eye makeup or if you are looking for a subtle almost-not-there lipstick. So, what about you? If you had to pick one lipstick that you could use just about everywhere, which one would it be?